Can Yahoo’s Growing Mobile Usage Drag It From The Revenue Doldrums In Q3? Yahoo will report its third-quarter earnings tomorrow. Analysts expect per-share profit of $0.33 on revenue of $1.1 billion. That compares unfavorably to Yahoo’s year-ago third quarter, in which it reported $1.1 billion in revenue, and a slightly higher $0.35 per share income. So investors are expecting Yahoo to be essentially stagnant at best. This is almost an oddity, as Yahoo has posted reasonably strong user growth in the past year, especially on mobile platforms. In September, Yahoo reported 350 million monthly active mobile users, up from 300 million reported for February 2013 in its 2012 annual report. During the 18 months preceding the end of 2012, Yahoo doubled its mobile user tally. In under three years, Yahoo picked up several hundred million monthly active mobile users. Yet, in its most recent quarters, the company has suffered from declining, or flat, revenue figures. GAAP display and search revenue, for example, were both down on a year-over-year basis in its most recent quarter. Though, if you remove traffic acquisition costs, those figures are roughly flat. 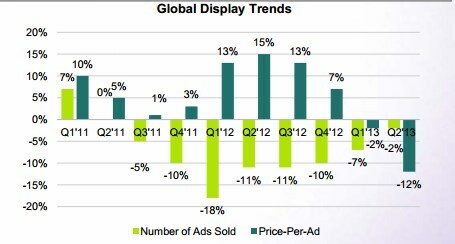 Total ads sold across Yahoo properties have declined in every quarter since (and including) the third quarter of 2011. The impact of those declines was blunted by rising per-ad revenue, something that was consistent until two quarters ago. Starting with the first quarter of 2013, Yahoo’s per-ad income began to fall. That decline coincides with a decline in the quarterly decrease of Yahoo’s total ad sales. Taking each component in order, we have growing mobile usage of Yahoo, a slowing of the fall of Yahoo’s ad volume, and a decline in per-ad rates. That points to, in my view, increasing monetization of Yahoo’s mobile properties and usage. Those sold ads are staunching its overall ad decline, but are perhaps not monetizing at rates similar to desktop ads. So the per-ad price slips as sales improve. If Yahoo can’t show year-over-year revenue growth from the third quarter of 2012, when it had – let’s guess – 100 million fewer monthly mobile users (that’s one-eighth of its entire user base that it reported last month! ), it would seem to indicate that mobile usage growth can’t replace falling search and desktop display ad incomes for the company — at least not yet. And that leaves Yahoo with a falling or flat top line until something changes. If the company can’t monetize the growing traffic that it directly wanted to monetize, how sound is its strategy? So, tomorrow we will be afforded another benchmark into Yahoo’s larger push to revamp its business. Facebook and Twitter have both recently proven that it is possible to monetize mobile traffic, provided that ad products match user activity. It’s Yahoo’s turn to step up. We’ll be watching tomorrow.